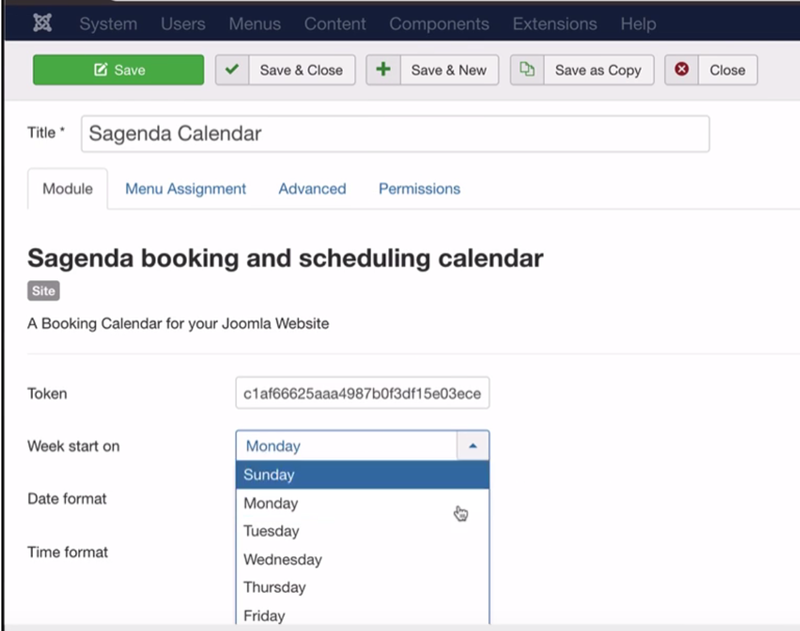 How to install a (Scheduling / Appointment / Booking) System to your Joomla! website? First, you need to create an account on Sagenda.net and define your service and events. Feel free to watch our other videos if you need help. How to download Sagenda’s Joomla extension? How to install Sagenda’s Joomla extension? From your Joomla! Admin Control Panel, just go to: Extensions / Manage / Install. Be sure to select “Upload Package File” tab. Now, drag and drop the sagenda zip file to the upload zone. Now, wait a few seconds while the Sagenda extension is uploaded. How to configure Sagenda’s Joomla extension? You need to understand that maybe some of those steps are already completed or not mandatory, but we will make sure you have all the required information. To add the extension to your site module, follow the next steps. Go to: Extensions / Modules / click “New”, select “Sagenda Booking and Scheduling Calendar” in the list. Add a title: either the same title or just “Sagenda”. Don’t forget to save from time to time. Make sure your plugin is activated. In “Extensions / Modules”, make sure there is a green check mark in front of Sagenda. If there’s a red cross, click again to activate it. Then, click the plugin to access settings. First, you need to enter your authentication code (aka: token) so the plugin can authenticate your Sagenda account. You will find this token in your Sagenda account under account settings and also on the Dashboard. Open your Sagenda account and copy this token, then paste it to your extension configuration. Don’t retype the authorisation code from this video or any other example since it will not display your data, which is as personal as your email address. Then, you can choose on what day your calendar week should start. In most cases, it’s Monday or Sunday. Let’s change it to “Sunday”. After changing the value in the drop down list, save your setting. Then, on the next reload, your frontend calendar will start each week with “Sunday” instead of “Monday”. You can then also change the date and time format. See a few examples: on the left, the date format, and on the right, the result in the calendar view. If you change your Joomla website language, the text date in letters will follow the language. We will come back later on more language options. For now, if I change the website language to “French”, “October” is replaced by “octobre”. Now, let’s try to change the date format. On the “Hint popup”, you have already some format example. Let’s try one! I will change it to “YY MM DD”. 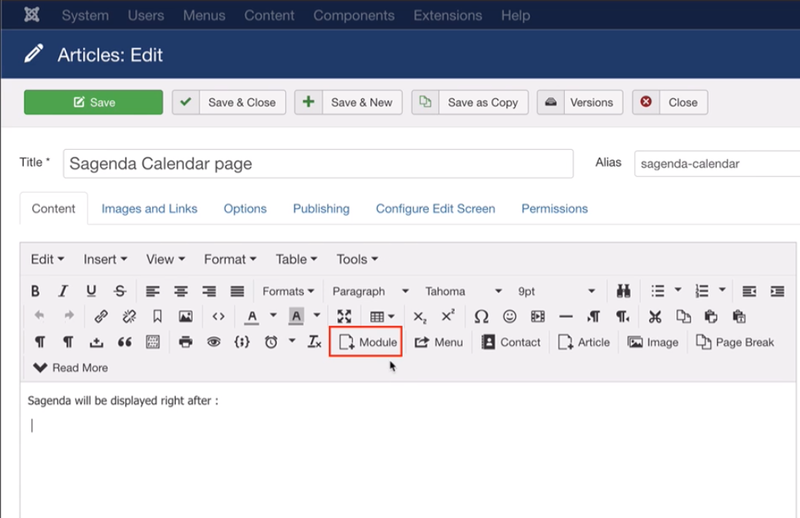 If you want to see the change immediately, don’t forget to save your Joomla page and reload your calendar page. What’s the result? Pretty ugly, right? Without dot, backslash nor dash the date is difficult to read. Let’s add dots in between. The result is much better, right? Let’s do the same for the time format. H in uppercase means hours counted from 00:00 to 24:00, while “h” in lowercase means hours from 12:00 AM to 11:00 PM. “A” add “AM or PM”. In order to have the American time format (e.g. 11:00 PM), you should enter: “hh:mm A”. Make sure your desired “Position” is set. Make sure you have the correct module assignment. How to change Sagenda’s Joomla language? The plugin uses your Joomla’s default language. Go to: Extensions / Language(s) / Installed. Sagenda will be displayed where the default is selected (starred). If needed, you can install more languages. How to display Sagenda’s Joomla extension? Select a page, for example: “Content / article / the desired page”. Click “Module”, select your Sagenda module. You will see a new “loadmodule” text on the page. Save changes. Sagenda will be displayed on this page on your frontend. How to update Sagenda’s Joomla extension? Sagenda’s extension uses the same update mechanism as your Joomla website. So if you know how to update to the last Joomla’s version, you know how to update Sagenda. Just go under “Extensions / Manage / Update” and the new Sagenda’s version will appear here. Alternatively, you can always download all our versions on our GitHub page. Don’t forget to watch our other videos on how to set up your account. We have also plenty of other integration options: as a link, as HTML, as other CMS plugins and so on. Thanks for reading and stay more productive with Sagenda!